Describing PM Narendra Modi as 'Gujarat's son', Shah urged people to vote for the Bharatiya Janata Party in all the 26 Lok Sabha seats. 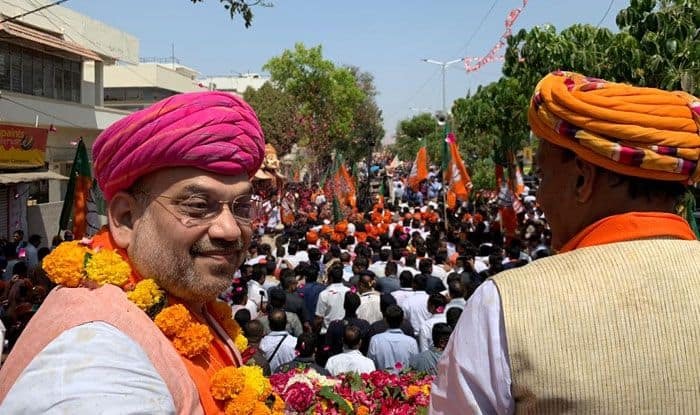 BJP president Amit Shah on Saturday filed his nomination papers for the Gandhinagar Lok Sabha seat, promising to pursue the legacy of party veteran LK Advani who had been representing the constituency. Shah, contesting his first Lok Sabha election, urged the people to vote for the Bharatiya Janata Party in all the 26 Lok Sabha seats to strengthen the hands of Prime Minister Narendra Modi, who he described as “Gujarat’s son”. Shah was accompanied by Union Ministers Rajnath Singh and Arun Jaitley as well as Shiv Sena chief Uddhav Thackeray. Gujarat will go the polls on April 23. Before filing his nomination, the BJP chief and senior party leaders addressed a gathering at Naranpura and held a roadshow. Former Punjab Chief Minister Parkash Singh Badal and LJP founder Ram Vilas Paswan also accompanied Shah. Shah, now a Rajya Sabha member, has replaced Advani, who had been winning from Gandhinagar since 1998. The last date for filing of nominations is April 4.